The multiplex masses who have so greedily gobbled down each release in the Marvel Cinematic Universe? They won’t able to tolerate the grindingly slow progression and lack of vitality in Trank’s Fantastic Four. The more cerebral film fan who’s been waiting for a mature or grounded take on the superhero mythos to come along? It’s far too stupid for them, and you’re certainly not going to get that segment into the theater with TV trailers highlighting action scenes that don’t even appear in the finished product, set to Kanye West’s “Power,” the single most done-to-death trailer song of the last three years. Comic book devotees? This film doesn’t even seem to be aware that it’s based on an iconic Marvel property. If anything, comic fans will hate this Fantastic Four even more than the previous two segments. So who? I honestly can’t imagine who the consumer is supposed to be. The fact that 20th Century Fox attempted to hold all press screenings and reviews until the last possible second wasn’t a good sign, but it also wasn’t a death sentence. What is a death sentence is a film that lazily meanders through endless exposition and pseudo science montages, spending almost its entire run in a series of hallways and featureless concrete slabs. The eye barely knows where to look, not because there’s too much to look at but because there’s nothing to be seen. I’ve never seen a film combine the following elements in this way: Deadly seriousness, idiotic characters, pulpy situations. They don’t seem like they could possibly all take place in the same film, and yet they do. The movie takes itself so, so seriously—it feels like a funerary march should be playing in place of a soundtrack—while simultaneously featuring characters so stupid that they’re making the types of decisions one would expect from scientists in ’50s-era creature features. This Fantastic Four really wants to be taken seriously for its attempts to highlight the “people behind the characters,” but they’re all so laughably dumb that it’s impossible to do so. This Fantastic Four dawdles in a way that no superhero film has for quite a while, which would be fine if the endless build-up was giving us anything about the characters that we could use. Ultimately, though, only Miles Teller as Reed gets any true characterization. Ben (Jamie Bell) is a tagalong friend with no useful skills or reason to even be present on the scene. Sue Storm (Kate Mara) is resourceful but ultimately just a victim of circumstance who is rendered moot by film’s end. Johnny Storm (Michael B. Jordan) doesn’t even mind the transformation into the Human Torch, and seems perfectly happy to serve as a military weapon in Third World countries. And then there’s Doom. Oh my lord, Doom. There is more characterization of Doom in the wikipedia page for this movie than there is in the film itself. He’s apparently Latverian, as in the comics, but that’s something we gather from a .5 second glance at a file. He has no accent and no backstory. For the majority of the film, he’s just a mildly antisocial, possibly foreign guy who is, you know … present … during the proceedings. Of course, that doesn’t stop one of the supporting characters from saying “he should be in prison.” What for? The film gives us literally no idea of what they’re talking about. We’re inundated with information we don’t need and desperately deprived of those few bits of information we do need. It’s like the editor included specific bits of dialog while working under the assumption that other scenes would be in the final cut, but they ended up on the cutting room floor. When you break down how the film utilizes its run-time, the results are staggering. Fantastic Four is roughly 1 hour and 41 minutes long, not counting credits. The four titular characters don’t manifest their powers until just about the 60-minute mark. As in, we are 60 percent of the way through before someone displays what one could call a “superpower.” Doom, on the other hand, is astonishing—it must set some kind of record for the latest a primary antagonist has been introduced in a big-budget superhero movie. He doesn’t step onto screen having become “Dr. Doom” until roughly the 82-minute mark. Which means this film does not find its primary antagonist until it’s 81 percent complete. Up to this point, you’re settling strictly for “Tim Blake Nelson obnoxiously chewing gum” as the only thing in the film that could be construed as an antagonist. I strongly suspect that’s precisely because a big, CGI-laden confrontation with Dr. Doom was hardly the way this film was originally intended to go in the vision of Josh Trank. As he did with Chronicle, what Trank wanted to do was focus on human characters, but unlike Chronicle, none of them are particularly likable. If they ever were in his previous cuts of the film we’ll never know—extensive reshoots have thoroughly scrubbed that away, only making things worse in the end. But Trank’s Fantastic Four was pretty clearly meant to be about a quartet of young, realistic characters struggling to come to grips with the things that have happened to them. Whether that actually makes for an entertaining movie, I have no idea, but it couldn’t have hurt to try when the alternative is such a confusing mess. Allow me to close with one specific example of the film’s disdain for the comics that will no doubt become a huge sticking point as disappointed comics fans walk out of multiplexes everywhere this weekend, shaking their heads ruefully. 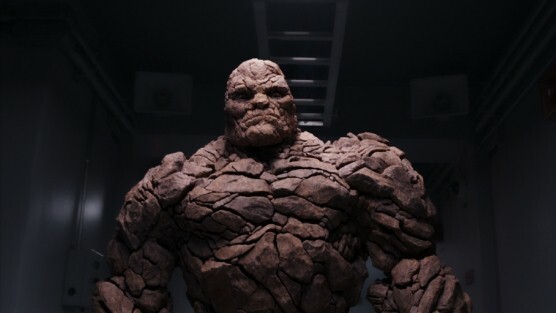 In this film, “It’s clobberin’ time” is the rallying cry of Ben Grimm’s abusive, baseball bat-clutching older brother when Ben is a child. When Ben Grimm’s brother says “It’s clobberin’ time,” that means “I am about to permanently scar your psyche.” It reminds me of Beverly Marsh’s abusive, leering father in Stephen King’s IT saying “Sometimes I worry about you Bevvy,” before he roughs her up. I don’t know what else to say. Fantastic Four isn’t good on any level. Not as casual entertainment. Not as the thought-provoking character study I think it may want to be (although it’s hard to tell). Not as a love letter to the comics, certainly. Marvel’s First Family suffers yet another ignominy. Jim Vorel is Paste’s news editor. He sincerely enjoyed the unreleased 1994 Roger Corman version of The Fantastic Four more than this movie. You can follow him on Twitter.